Attaching a trailer to your truck or SUV can really expand its hauling capacity. But towing a trailer isn’t as simple as it looks. If you’re new to trailer towing, or you’ve had a bad experience in the past, take the right steps to ensure increased safety this time around. Check towing capacity: Ensure your vehicle is capable of handling the load you have in mind. Look up the towing capacity before you move forward with your plans. Select a hitch: Choose a hitch that can handle the gross trailer weight (GTW) and maximum tongue weight. Hitches range from Class 1 (2,000 pounds GTW/200 pounds tongue weight) to Class 5 (10,000 pounds GTW/1,000 pounds tongue weight). Even if you’re only planning to tow a small trailer, you need to take the weight of its contents into account, so plan to compensate by purchasing a hitch one class higher than you think you need. Lane requirements: Towing vehicles are typically required to drive in the slower right hand lane except when passing. Speed limit requirements: These laws vary from state to state. 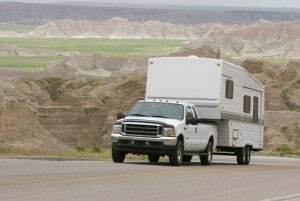 For example, here in Colorado, you can legally go the posted speed limit when towing a trailer. In Wyoming, you are restricted to 75 mph on the interstate and 65 mph on two-lane highways. Check the towing laws for the states you plan to drive through before you hit the road. Attach the tongue: For a regular ball hitch, properly attach the trailer tongue to the vehicle hitch. Snap the locking mechanism and put the lock pin in place. Connect the chains: These stretch from the trailer to the vehicle. Crisscross the chains under the tongue in an X configuration. This way, if the tongue slips free, it will land on the crossed chains rather than hitting the pavement. Connect the plug and socket wiring to the vehicle’s harness: To prevent corrosion, spray the contacts with dielectric grease. Set up an equalizing hitch, if necessary: This takes pressure off the vehicle’s hitch and transfers some of the weight to the vehicle’s front axle. Adjust the drawbar height: This step is important to keep the loaded trailer level to the ground when attached to the towing vehicle. Check the tongue’s connection to the hitch: Pull up on the trailer as if you are trying to pull it off the hitch. You should be unable to do so. Inspect the trailer’s clearance: Make sure any trailer stands are in the “up/drive” position. Check the trailer’s contents: Make sure cargo is moved as far forward within the trailer as possible to increase tongue weight, add stability and decrease swaying on the road. Inflate the trailer’s tires: Aim for the manufacturer’s maximum recommended cold pressure. A properly inflated tire will run cooler and safer. Check all trailer lights: If you don’t have a partner to help you check, turn on all parking lamps and hazard flashers. Walk behind the trailer and make sure all the bulbs are illuminated. If so, it means you have turn signals and brake lights, since these use the same filaments as parking lamps and hazard flashers. Practice towing: Before you hit the highway, get familiar with your vehicle-trailer combination by testing the setup in an empty parking lot. Use this time to practice backing up, one of the trickiest parts of towing a trailer. Understand the need to make wide right turns: This prevents the trailer from ending up on the sidewalk or running into a telephone pole. Give yourself extra time to stop: Your vehicle is towing a heavy load, so it takes longer to stop. Follow at a safe distance to prevent the need to stop suddenly. Learn your trailer’s clearance: This way, you don’t run into trouble entering a tunnel, parking garage or fast food drive through. Check tie downs: About 10 to 20 miles after you initially depart, pull over and inspect the tension of any tie downs you’re using. Regardless of how tightly you secure them, road vibration loosens these ties over time. Inspect the trailer hitch and wiring: Each time you stop, make sure the hitch and wiring connections are secure. Check tire pressure: After a few hours of driving, get out of the car and place your palm on each wheel bearing to determine if any are significantly hotter than the others. Tires become overheated when the pressure is low, which could cause the tire to fail. Check the pressure and look for any leaks before continuing on. If you regularly tow with your truck or SUV, the clutch can wear down much more quickly than in vehicles that never tow trailers. To preserve responsiveness, be sure to stop by Scott’s Fort Collins Auto for transmission care before your next towing adventure.